Jeddito Black-on-yellow bowl. Click the image to open the Jeddito Yellow Ware gallery. Jeddito Yellow Ware is a type of pottery that was made exclusively at the Hopi Mesas in northern Arizona and widely traded throughout the Southwest. Probably no ware of Pueblo pottery is admired as much as Jeddito Yellow Ware. Not only are vessels of this ware conspicuous for beauty of form and for elaborate designs, but probably are admired as much for the clear, bright yellow tones of the vessel surface. 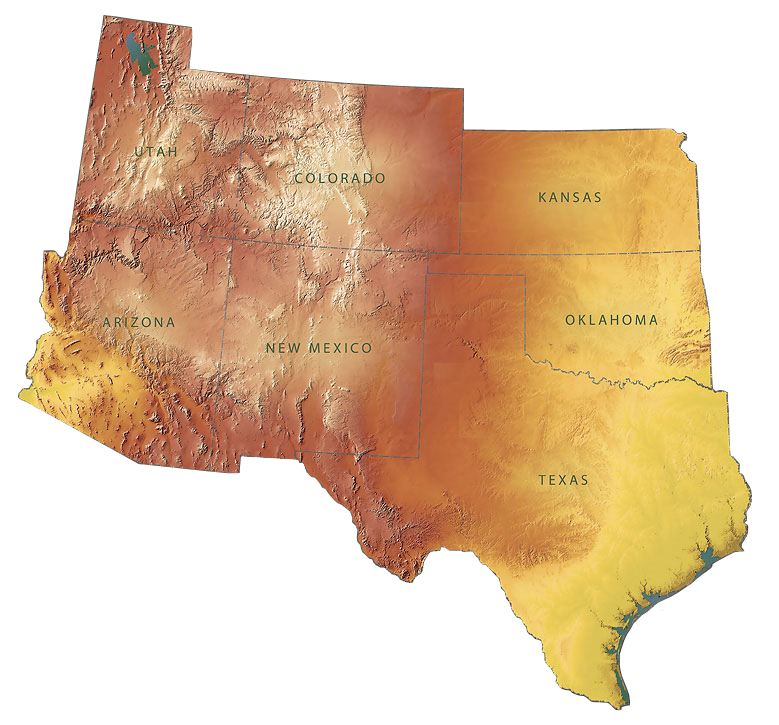 Hargrave (1935, in Colton 1956) has suggested that the vessels of gold that lured the early Spanish explorers into the Southwest easily could have been pottery vessels of Jeddito Yellow Ware, as to natives who did not refine metals, “gold” might refer to color. The ware developed late. Its appearance does not mark a great change or special advancement in techniques since early examples of this ware do not differ greatly in form or finish from vessels made long before. The same materials used in manufacturing vessels of Awatobi Yellow and Jeddito Yellow wares were used in vessels of the earlier orange, gray, and white wares of the same region. Where vessels once were white or orange, later they were shades of yellow. The chief ceramic change was in the black paints; a shift from manganese and carbon to iron and carbon. 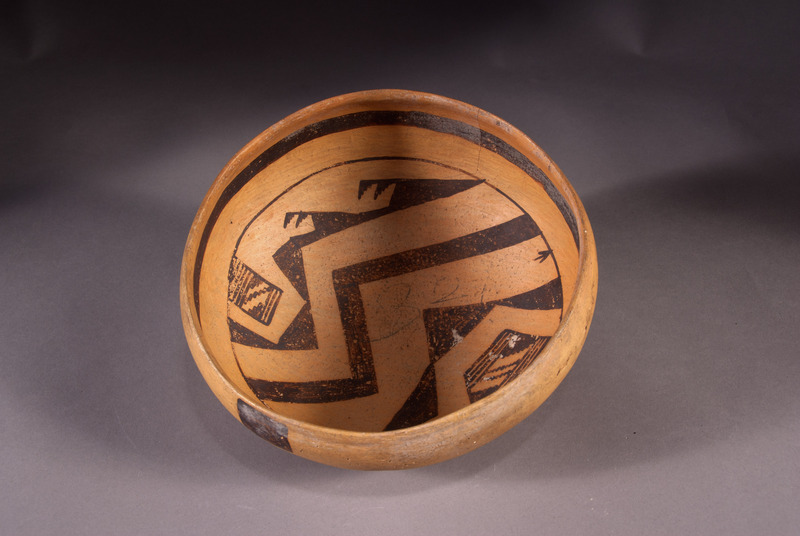 Types included in the American Southwest Virtual Museum include: Awatovi Black-on-yellow, Bidahochi Polychrome (image gallery only), Huckovi Black-on-orange (image gallery only), Jeddito Black-on-orange (image gallery only), Jeddito Black-on-yellow, and Sikyatki Polychrome. Date Range: A.D. 1300 to present day. Core Color: Creamy yellow or tan, occasionally pinkish or brownish. Temper: Rarely quartz sand; usually not visible without a hand lens; occasional reddish angular fragments. Surface Finish: Both surfaces of bowls, exterior surfaces of jars, compacted in all types except in Kopop series which are slipped; surfaces of all types well-polished; interior of jars scraped, frequently well-smoothed. Surface Color: Red, orange, through yellow to cream; compacted surfaces, usually cream, yellow, sometimes light orange or brownish yellow. Vessel Thickness: 4.1 to 9.8 mm; average about 6.7 mm (jars); 3 to 10 mm; average about 6.4 mm (bowls). Paint: Black: often brownish; white: on some types, usually somewhat fugitive; red: in combination with black in some types, red in combination with black and white on Kawaioku (sometimes spelled Kawaika-a) Polychrome. Pigments: Black: ground inorganic vehicle, sometimes a little manganese or copper; white: presumably kaolin. Design: Usually well executed; always on bowl interiors and jar exteriors; less frequently on bowl exteriors; stippling on Jeddito Stippled and Sikyayki Polychrome; engraving through paint on Jeddito Engraved and Sikyatki Polychrome.